Are Muscovites friendlier than New Yorkers? Our Russia-born correspondent in New York City embeds himself deep into the fabric of the Big Apple in order to answer the question: In which of the two cities are people more humane and kinder to others. In Moscow restaurants - unless we’re talking about McDonald’s - customers aren’t usually seated at the same table with strangers. If I heard this offer from a hostess in my home city, I’d be very surprised. If all tables were taken, you’d just go to another place. I don’t want to share a table with people I don’t know, and I find this very disturbing. But New Yorkers have no problems sharing a table. The last time I had a cappuccino in a lovely cafe near my house I was sent to a table with a friendly couple who didn’t talk much, but who also didn’t make me feel like an intruder. Before moving to New York, there was a strange family living in the building where I rented a flat in Moscow. A family of four shared their apartment with an aging male relative who couldn’t even remember his own name. He never took a shower and would sometimes poo in the garbage dumpster that our building used. The smell was unbearable. Sometimes I saw him by my door, dressed in a World War II uniform, mumbling something. Not a single neighbor complained. Ever. Everyone felt sorry for him and tolerated the fact that his family didn’t want to send him away. Just in the last few months in different public places I’ve met: an aspiring 60-year-old jazz singer; a Hollywood script writer; a beautiful black woman called Katyusha (that’s actually the name of a famous Russian artillery launcher); a guy who lives a couple of blocks away with his cute Dalmatian puppy; and many other interesting people. I’ve been invited to parties and performances, or simply told about a great bakery next door. None of these people became my long-term acquaintances or friends, but I assume that some meaningless small talk is useful to those who are old and lonely. In Moscow, people don’t often communicate with strangers, which can be a little hard for those who are alone. Seriously, they do. The gloomy inhabitants of Russia’s capital are helpful. A woman trying to drag a heavy suitcase up the stairs won’t have to ask for help: it’s most likely someone will offer her a hand. Ignoring the disabled, pregnant, or elderly is still taboo on the Moscow metro: someone will offer a seat to them. And if you dropped something, such as a scarf or a glove, people will let you know. In the Big Apple, people mind their own business. New Yorkers don’t care what’s happening around them, but they pull together in case of a serious accident or major catastrophe. New Yorkers are loud. They are so loud that talking in a bar or a restaurant often turns into a vocal competition with those sitting next to you, screaming out details of one’s private lives. Muscovites are quieter, unless you cross a line. The older generation, and sometimes even young Russians, will definitely let you know if you’re bothering them. “Why are you standing so close to me? Not enough space for you in this carriage?” or the famous one, Po nogam kak po parketu (“Stepping on feet like on parquet floor,” something Muscovites say if you step on another’s foot). People around the planet are basically the same, but growing population density, overcrowded public transportation and the crazy pace of urban life are bringing the worse out in many of us. It’s just the question of how we react to and cope with the stress of life in big cities. 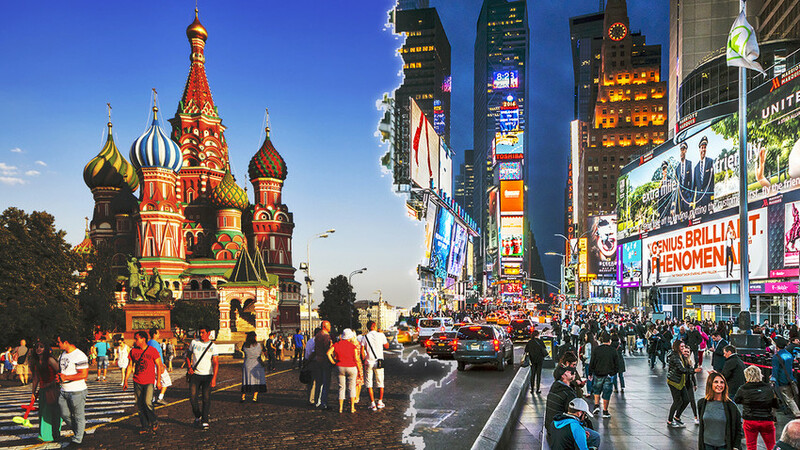 New York versus Moscow: Is life in Russia’s capital better or worse?